Decked out in leather vests and black hoodies, the Soldiers of Odin are spreading their message of white nationalism on the streets of Halifax. At least, they were up until a couple of weeks ago. 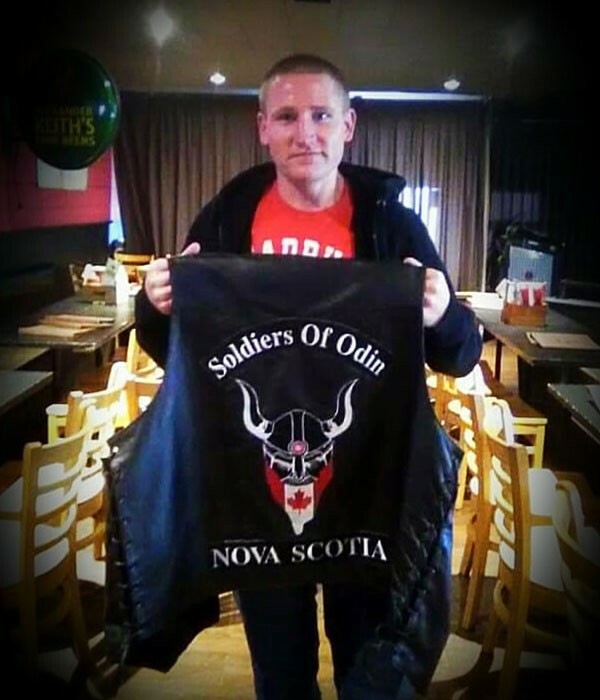 The Nova Scotia chapter of the far-right Soldiers of Odin network disbanded earlier this month over disagreements with the mother chapter in Finland. Speaking over Facebook messenger, former president Billy Rushton would only say the quarrel was more about financials than ideology. The father of two from Amherst says he’s starting a new charitable organization to replace the Nova Scotia SOO, which will feature many of the same members, if not ideas. Soldiers of Odin, a loose-knit international organization dedicated at its core to “protecting” white culture, has carved its name across Europe and Canada over the past few years. It’s one of the more visible battalions in a new crop of far-right extremist groups emboldening hate and radicalizing white Canadians. The group’s use of street “patrols” are a concrete reminder of their views, acting as an intimidation tactic towards immigrant, refugee and Muslim communities. These are the people who don’t want you here. 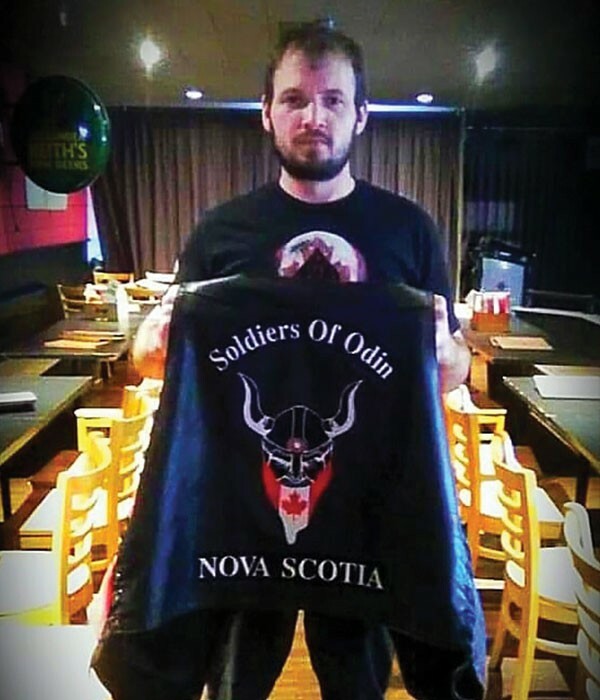 Nova Scotia’s Soldiers of Odin chapter sprang to life on June 1, but only over the past few weeks has the group come to the attention of Halifax residents. Last month several of the local SOO’s 11 members began walking the city’s streets, wearing branded merchandise and boasting of their activities. Anti-Muslim and anti-immigrant rhetoric is nothing new online, and racism in Nova Scotia stretches back centuries. But the Soldiers of Odin and its ilk represent an organized path to normalizing hate speech. Its existence is the wellspring from which intolerance proliferates like cholera. The presence of its proud membership on the city’s street, a potential threat to the peace. Mimicking the clothing of motorcycle clubs and adopting Norse iconography as an identity, the Soldiers of Odin formed three years ago in Finland as an anti-immigration group of far-right radicals. Its white membership was responding to a wave of refugees, many of them Muslim, trying to seek shelter from civil war and genocide. In Canada, the SOO and similar groups began to form after Justin Trudeau’s 2015 promise to help resettle 25,000 Syrian refugees. Donald Trump’s victory the following year only poured gasoline on the fire. The unifying thread between the Soldiers of Odin and other groups like the Proud Boys or III% is a nationalism fueled by racism, xenophobia and an urge to protect what they narrowly consider to be Canadian values. Online and in real life they offer a safe space for racism; somewhere where it’s OK to be a white supremacist. Outwardly, though, the SOO members present themselves as invested in charitable work. They give out pizza to the homeless, praise veterans and pick up litter. Entry-level acts of kindness that mostly serve to downplay their extremist beliefs. 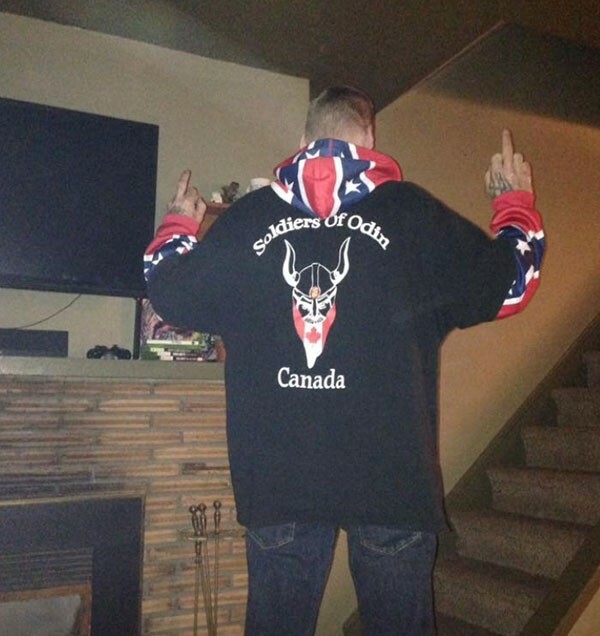 Balgord says the first iteration of the Soldiers of Odin in Canada had many obvious ties to neo-nazis, but the network splintered last year over disagreements about whether to remain loyal to Finland. The founding chapter has strong Nazi sympathies and doesn’t shy away from violence. Its president was convicted for a racially motivated assault back in 2005. Point blank, Rushton says he is not racist. In no way, shape or form does he feel hatred towards another race. What he is bothered by, he admits, are the “demands” immigrants are making on Canada’s culture. The national anthem was changed to be gender-neutral, he points out. Statues are being torn down to better reconcile Indigenous history. Never mind that neither event has anything to do with immigration, they’re still examples he lists of how newcomers are spitting on Canadian values. The absurd rhetorical lengths far-right groups will go to claim they’re not racist even while explicitly making racist remarks is a familiar tune to Barbara Perry. 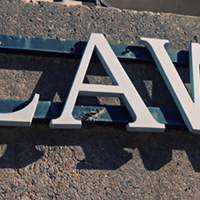 A professor of criminology at the University of Ontario’s Institute of Technology, Perry’s written extensively on hate crime and researches extremist groups in Canada. Individual members are just as blatant. Images shared by Norman English online. Several regularly post violently anti-Muslim comments and white supremacist imagery. 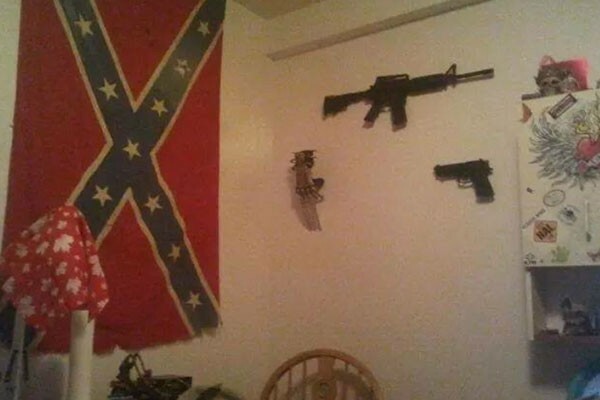 One of the more aggressive voices in the local movement, Dartmouth member Norman English, has a photo on his personal Facebook of a handgun and an assault rifle proudly displayed next to a Confederate flag. English did not respond to a request for comment. A veteran of the Armed Forces and a commissionaire, Bauer was one of the people involved in Rushton’s Nova Scotia chapter before leaving due to the group’s beliefs. He says he came across the SOO online and was attracted to its more innocuous public goals of championing veterans and supporting Canadian heritage. Over the course of several weeks, he went from curious Facebook fan to being named as the chapter’s vice president. By that point, he was already feeling uncomfortable with the racist imagery other members were sharing. Last month he cut off all association. Perry says it’s common for these far-right groups to try and find some non-threatening hook to draw in new members. Sometimes that’s music, sometimes it’s an interest in military history. It can even just be camaraderie—a sense of belonging. Over time, the recruits get exposed to more and more radicalized ideas. “It’s not necessarily a linear process and it’s not an immediate process,” she says. For many, that’s their cue to exit. 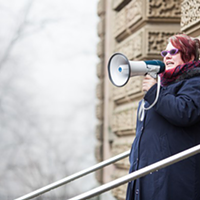 Perry says she’s come across plenty of people who, like Bauer, join the SOO or another group unaware of its true nature and leave shortly after being exposed to its radical underbelly. One of her current research colleagues spent years as a recruiter high up in the skinhead movement. The violence of that world drove him out, she says. Members see the call to arms as one of self-defence. Rushton, who claims to have many Muslim friends, blames the religion for terrorism events the world over. It can’t be racist if it’s the truth, he claims. He’s wrong, on multiple levels, and not the least because, statistically, Canadians have far more to fear from the Soldiers of Odin and their brethren than Islamic extremists. A 2015 study by Perry and her colleagues found that between 1980 and 2014 there were over 120 incidents of violence in Canada from far-right extremists, ranging from attempted assassinations to fire-bombings and shooting sprees. Her research echoes similar findings down in the United States, where the Anti-Defamation League’s Centre on Extremism found that right-wing extremists and white nationalists were responsible for 59 percent of all extremist-related fatalities last year. Since 9/11, white supremacists and other far-right extremists have killed more people in America than any other category of terrorist. Tragically, recent examples are plentiful. Just days after one far-right terrorist in the US was found mailing bombs to journalists and politicians late last month, another anti-semitic extremist killed 11 worshippers at the Tree of Life synagogue in Pittsburgh. Canada isn’t far behind. Two years ago Alexandre Bissonnette shot and killed six and wounded 19 others at a Quebec City mosque. Four years ago, the anti-government, pro-gun radical Justin Bourque killed three RCMP officers and severely injured two others in Moncton. This past summer, Matthew Vincent Raymond shot and killed four people, including two police officers, in Fredericton. Raymond, it would emerge, had recently been barred from a local coffee shop for his rants against Islam and Syrian refugees. It bears mentioning as well that the closest Halifax has come to an act of deadly terrorism was the mall shooting plot planned three years ago by Columbine-worshipping, neo-nazi fans. Even just the spectre of violence from these groups is a real threat to those communities who know they’re being targeted, says Perry. Growing up in Halifax, Masuma Khan is certainly familiar with Islamophobia. 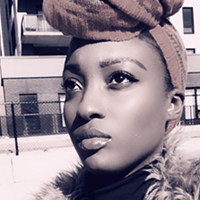 She watched her parents suffer attacks from white Canadians who didn’t think her family belonged. She regularly hears from other members of the Muslim community who have been yelled at, called terrorists, made to feel alienated in their own home. People forget hate happens everywhere, she laments. 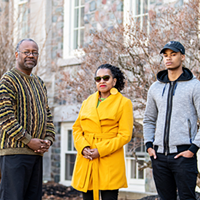 The vice-president academic and external for Dalhousie University’s student union has herself been targeted by that hate. A year ago, Khan criticized the #whitefragility of settler Canadians upset about a symbolic DSU motion to not participate in Canada Day. It was meant as recognition of the country’s historic mistreatment of Indigenous peoples; a reminder that we are all immigrants on unceded land. For her effort, Khan was lambasted by right-wing pundits, investigated by her own university and to this day receives threatening messages and death threats. Sadly, the climate for that hatred is getting worse. Devon Boudreau of Halifax (above) and Mike MacKay of New Glasgow (below) becoming SOO members last month. Perry’s research has found there’s been a 20 to 25 percent jump in the number of far-right extremist groups across Canada over the past three years. From coast-to-coast, there are now over 100 different groups. 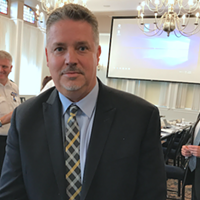 Both Halifax Regional Police and the Nova Scotia RCMP say they continue to monitor organizations like the Soldiers of Odin and stay informed about “trends” such as the propagation of far-right extremist groups. 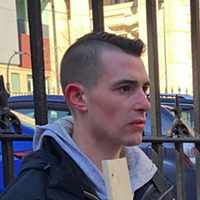 “Nova Scotia RCMP is aware of this group, however, we have no active investigations involving it at the present time,” says corporal Jennifer Clarke. The response, for Khan, indicates the bias of largely-white law enforcement agencies. Even with the increase in far-right groups across Canada, it’s worth noting that membership numbers remain statistically minor. A joint rally of far-right groups on Parliament Hill back in July gathered fewer than 100 people. The Nova Scotia SOO Facebook page has 157 followers, many of whom are visitors from other SOO echo chambers across the internet. On the spectrum of violence, Balgord says it’s unlikely the Soldiers of Odin or any other group would coordinate a planned attack. A more plausible scenario would be a single soldier or SOO fan who becomes radicalized and carries out the group’s message to deadly result. More broadly, the threat these far-right movements represent is a shifting of norms towards a more intolerant society. “They’re making it more acceptable to be racist and to share those views publicly,” says Balgord. Soldiers of Odin members in Nova Scotia gathering with family for a photo. 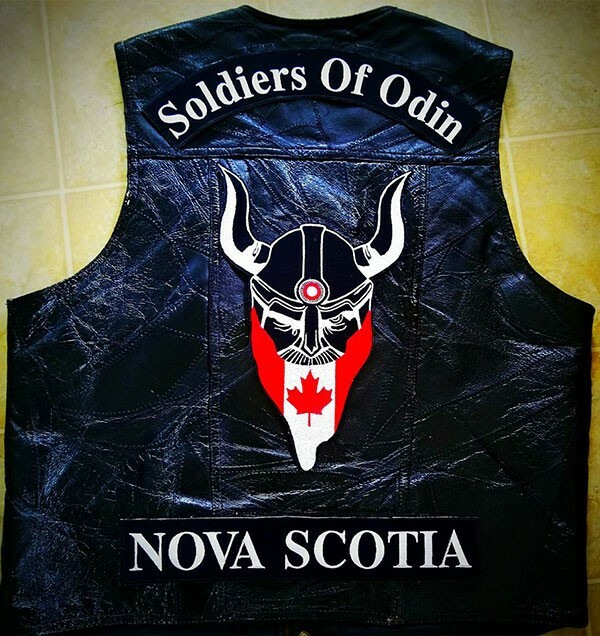 Unless some other entrepreneur decides to start a new chapter, Nova Scotia’s Soldiers of Odin are no more. 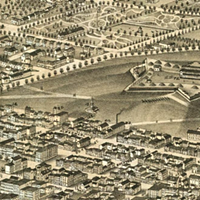 It’s been replaced by a new structure made up of the same old parts, and according to its president, strictly dedicated to charitable work. The president won’t confirm any of his members, nor will he disclose the name of the new group until he’s secured trademarks for the logo. One former SOO member, however, tells The Coast that the new group is called Thor’s Knights. A Facebook page under that name lists Rushton’s Amherst phone number as its contact. Rushton disputes this and claims Thor’s Knights is an old club that was supposed to be deleted long ago, despite the page seemingly having been created just two weeks prior. The name and the charitable undertakings don’t really matter, though. 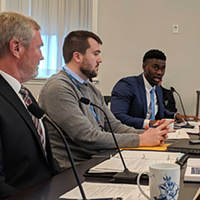 If Rushton and his membership split with the Soldiers of Odin not because of Finland’s neo-nazi ties but over financial mismanagement, Balgord says that shows something about the new group’s mission. Rushton says the new club’s bylaws will include immediate dismissal for any member found engaging in racist behaviour, speaking in disgust against another race or acting in violence against a race. But that doesn’t include “announcing your beliefs” about another race, he clarifies. The group will also not be above taking time away from its stated charitable mission to hold public rallies to spread its message. Bauer isn’t convinced. He says he wants nothing to do with the new group. 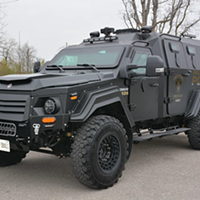 Even without the SOO, both Balgord and Perry say they’ll be watching the east coast more closely now as the spread of far-right extremism in Canada continues. Rushton shrugs off all the criticism. He’s unconcerned with why Nova Scotians should tolerate his new group. White supremacist John Mark Tillmann's book, Stealing the Past, has been put on hold by Nimbus. Opposing group, Special Olympics fundraiser hold events on the same day, same time. Don't think you're safe just because you're not in America.